Arthropods have spatially repetitive units, called segments, along their body axis, which is a tightly-conserved feature in arthropod evolution. The signs of this spatial repetition can be observed as stripes of gene expression in embryos. But how does the pattern of stripes arise in an arthropod embryo? Scientists accumulated a lot of knowledge from the fruit fly Drosophila melanogaster (a well-studied model insect), followed by studies of other arthropod species. But they have realized that there are many various answers to the above question depending on the species used in the study. One complicating factor is the species-specific nature of the field where stripes of gene expression are patterned. The field in the early embryo of the fruit fly is a syncytium, in which all nuclei increasing in number share their cytoplasm. Spatially-repetitive stripes are generated in the syncytial field, with no need for signaling through cell membranes, and afterward, cells form to enclose each nucleus. But early embryos of many arthropod species consist of separate cells and require communication among the cells through the cell membranes in patterning stripes. This type of embryo is thought to be more common outside insects. However, there have been no good model arthropods that allow us to chase the process leading to repetitive stripes in such a cell-based field. 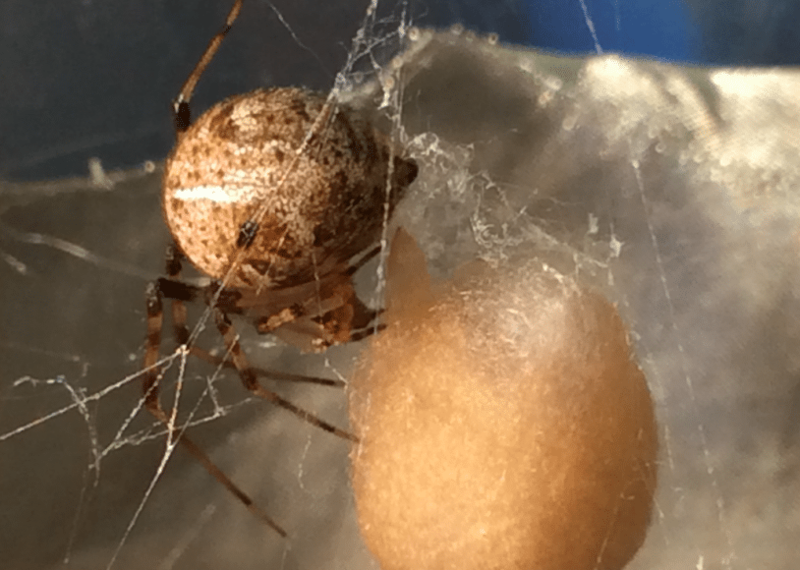 In recent work, we provided a breakthrough on this matter, using a common house spider Parasteatoda tepidariorum. The spider embryo has a cell-based field from the earliest stages of development . Taking advantage of hundreds of eggs in a single egg sac, we collected and analyzed a large data set of fluorescently-stained sibling embryos. This allowed us to reconstruct stripe pattern development in the embryonic field, which visualizes temporally-repetitive events that give rise to spatially-periodic stripes. The stripes are expression of a hedgehog (hh) gene, which was originally identified in the fruit fly and named after its mutant phenotype, that is, a hedgehog-like denticle pattern on the larval epidermis. Highlighting features of the reconstructed pattern development are different dynamics of hh expression depending on the region of the field (see Movie 1). In the field contributing to the head of the spider embryo, a stripe travels like a wave, followed by repeated splitting (see the upper region in Movie 1). The resulting three stripes correspond to the three head segments. In the field contributing to the abdomen (formally called opisthosoma), waves of hh expression sequentially arise and travel, transforming into spatially periodic stripes (see Movie 2). Cell labeling experiments suggested that these waves occur as ordered oscillation of gene expression in the cell populations. Splitting and oscillation are typical modes of repetitive dynamics that are often produced in simulations of simple mathematical models. The splitting and oscillation cycles in the spider embryo were estimated to take roughly 5 hours. In contrast to the terminal regions of the field, the middle region (contributing to the thorax bearing four pairs of legs) displays spatially periodic stripes simultaneously appearing at an early timing (see red stripes in Movie 1). This indicates that a third mechanism operates there. In sum, this study has shown that similar periodic patterns result from different processes in a continuous field of cells, providing a new platform to explore the diversity of mechanisms of stripe formation. From an additional viewpoint, the total shape of the field changes from a disk-like to a band-like form (see Movie 1). To achieve this body-shaping process, the cells increase in number by cell division, collectively move, and occasionally change their neighboring cells. One could speculate that the individual cells in the field need to make flexible responses and reactions to the changing environments to coordinate their behaviors and the stripe-forming events. Thus, we propose that the spider embryo provides a unique opportunity to study the relationship between cell behavior and patterning process, which is not satisfactorily achieved with studies using fruit fly embryos. Finally, in the spider embryo, the activity of the Hh signaling pathway is needed to organize a global polarity of the cell-based field that links to segment formation . “Hh” is a diffusible signaling protein secreted from the cell. Cell-to-cell communications using the same signaling pathway are known to function to make spatially repetitive patterns in vertebrate tissues, such as the limb skeletal pattern. But the tissue fields of the vertebrates have complex organizations, compared to the spider embryo. The geometric simplicity of the spider embryo is an important attractive factor for use of this animal for the basic research. The species P. tepidariorum is calm and easy to breed in the laboratory. Its genome has been sequenced , and the value of this animal has been increasingly appreciated among scientists. These findings are described in the article entitled, A quantitative study of the diversity of stripe-forming processes in an arthropod cell-based field undergoing axis formation and growth, recently published in the journal Developmental Biology. This work was conducted by Natsuki Hemmi and Hiroki Oda from JT Biohistory Research Hall, Yasuko Akiyama-Oda from Osaka Medical College, and Koichi Fujimoto from Osaka University. Kanayama, M., Akiyama-Oda, Y., and Oda, H. (2010). Early embryonic development in the spider Achaearanea tepidariorum: microinjection verifies that cellularization is complete before the blastoderm stage. Arthropod Struct Dev 39, 436-445. doi:10.1016/j.asd.2010.05.009. Akiyama-Oda, Y., and Oda, H. (2010). Cell migration that orients the dorsoventral axis is coordinated with anteroposterior patterning mediated by Hedgehog signaling in the early spider embryo. Development 137, 1263-273. doi:10.1242/dev.045625. Schwager, E.E., Sharma, P.P., Clarke, T., Leite, D.J., Wierschin, T., Pechmann, M., Akiyama-Oda, Y., Esposito, L., Bechsgaard, J., et al. (2017). The house spider genome reveals an ancient whole-genome duplication during arachnid evolution. BMC Biol 15, 62. doi:10.1186/s12915-017-0399-x. Hiroki is a research scientist at the Biohistory Research Hall, Evolutionary cell and developmetal biology.